Tom Brady will open the season at quarterback for the Patriots in the NFL season opener on Thursday against the Steelers instead of serving the start of a four-game suspension. After all the controversy, the investigation, the court cases, the endless speculation, the NFL season kicks off tonight on NBC. How many will be watching? Try at least 27 million, which eclipses — for proper context — the Fox GOP debate last month with three million to spare. The game may feature two of the winningest franchises of this century in the form of the Steelers and the Patriots, but all eyes will be on one player:Thomas Edward Patrick Brady. And the Peacock certainly couldn’t be any happier with making him tonight’s protagonist/antagonist (depending on where you live), as just one week ago it looked as if the defending Super Bowl champs would have to take the field with the household name that is Jimmy Garoppolo at quarterback. But in what amounted to a Hail Mary in court, a judge found that the NFL went too far in its punishment of Brady given how scant the evidence was in directly linking him to the crime of deflating footballs before last year’s AFC Championship Game. And quiet frankly, the ruling couldn’t be any more correct. This case was always the sports version of A Few Good Men. Was a crime committed? Yes. But did it come directly from the top of the food chain in command on the team (Brady)? That was always the assumption given who supposedly benefited (Brady actually played better when the balls were properly inflated in the second half of the Colts game and the Super Bowl), but assumption isn’t guilt. Remember, a guy like Brady — like a mob boss — has all the power and therefore doesn’t have to get his hands dirty directly when carrying out a hit (or in this case, a hiss). He has proxies for that… those acting on this behalf. And perhaps here, there’s plenty of reason to believe Brady gave the order for the Code Red (to deflate the balls), but that order also could have come from a lower-level lackey (quarterbacks coach, receivers coach, offensive coordinator, etc) who believed they were doing what Brady preferred (softer balls), even if the QB didn’t specifically ask for the deed to be carried out. This isn’t to say Brady’s an angel here… it just means it’s hard to actually prove he ordered the NFL version of a Code Red directly. And so, I digress. Back to the game and specifically the audience size, the question is how: As in… how has the NFL become the greatest, biggest, most dominant entertainment program in television history? Is it the excitement of the game? Sure… it moves infinitely faster than baseball, is easier on the eyes to follow and absorb than hockey, and is less predictable than the NBA, where rarely a 1- or 2-seed in the NBA playoffs doesn’t win a championship. Americans love the violent ballet of athleticism and brutality that is the NFL, which only grows more compelling when conditions worsen as the season goes on. The league also markets itself exceptionally better than any sport by making every game–even those in early September–feel like an event. Pre-game concerts (Ellie Goulding and Train perform live before tonight’s game, for example) help bring in the passive or non-NFL fan. And on the field, there’s utter unpredictability thanks to the parody created by the salary cap and free agency. Note: The last time the NFL had a repeat champion? Over a decade ago. Overall, the AGA estimates that almost $93 billion in illegal bets will be taken on NFL and college football this season, while only about $2 billion will be legally wagered in Nevada. How much is $93 billion? Oh…only larger than the GDP of 124 countries. What’s amazing about this number is the fact that there’s a federal ban on sports betting in most states that has existed since 1992. But online betting via sites (allegedly) sitting in other countries is an avenue that exists with almost no oversight. And even the major sports leagues are contradicting themselves by publicly stating they oppose gambling because it could hurt the integrity of the sport, but then turn around and promptly sign sponsorship deals with daily fantasy sports companies (think DraftKings.com) which permit members to essentially bet on fictional teams they create with non-fictional players. Overall, 30 million Americans will play fantasy football this season, including eight million women (including my wife again). And as a result, NBC, Fox, CBS, and ESPN will all get bumps in their ratings for any and every game–even the horrific ones–thanks to the interest fantasy/gambling creates. NBC used to rule Thursday night with must-see-TV via Friends and Seinfeld. Now thanks to the annual Thursday night NFL opener, it will rule again as it has since 2002. 27 million — maybe even 30 million people given the Brady/Pats factor — will tune in tonight. Is it to see if the Steelers can pull an upset? To see the Pats begin another chapter on the road to perhaps another championship? To see Brady literally taking a pin to footballs on the sideline? Sure… all of that. But many will be there to see if New England can cover the 7-point spread. Others will watch with no interest on who wins or loses, but how many points are scored (current over/under 51.5). Millions more will be rooting for Ben Roethlisberger one minute and Rob Gronkowski the next despite them playing on opposite teams…all thanks to fantasy football. But the real winner tonight won’t be anywhere near the field. Instead, it will be executives back in New York at 30 Rock (NBC) and 280 Park Avenue (NFL HQ). The cash cow gets milked again for the billions upon billions it will produce this season. The trifecta of controversy, gambling and the violent ballet that is professional football will prove once again to be the TV show fewer Americans can resist. The NFL Players Association’s successful appeal of Tom Brady’s Deflategate suspension has opened the floodgates for current players who have bones to pick with the league. According toBill Phillips of WPXI in Pittsburgh, Steelers linebacker James Harrison is mulling a lawsuit against the NFL. “I’m just wondering how far they can go with it with the other guys that he suspended or fined at his discretion,” Harrison said. This comes after U.S. District Court Judge Richard Berman threw outthe four-game ban the league levied against Brady for his suspected role in the Deflategate affair. While discussing reasons why a judge could overturn an arbitrator’s award under a collective bargaining agreement, Berman notes that an arbitrator “is not free to merely dispense his own brand of industrial justice.” He also notes that the “law of the shop” in the NFL is for players to be made aware of prohibited conduct and potential discipline, something that Berman finds the NFL did not do in regard to Brady. According to Phillips, Harrison is planning on talking with the NFLPA as to whether he has legal grounds for a lawsuit against Goodell and the NFL, similar to Brady’s Deflategate suit. With Judge Berman calling Goodell’s authority into question, you can understand why Harrison would want to explore whether he can receive monetary restitution for what may have been unfair fines. The 37-year-old isn’t the first player after Brady to consider the idea. ProFootballTalk’s Mike Florio reported in August that Dallas Cowboysdefensive end Greg Hardy was thinking of following in Brady’s footsteps and appealing his four-game suspension to start the 2015 season. If Hardy or Harrison takes legal action against Goodell, it could embolden others to as well. And should that happen, Goodell’s position as commissioner may become untenable. 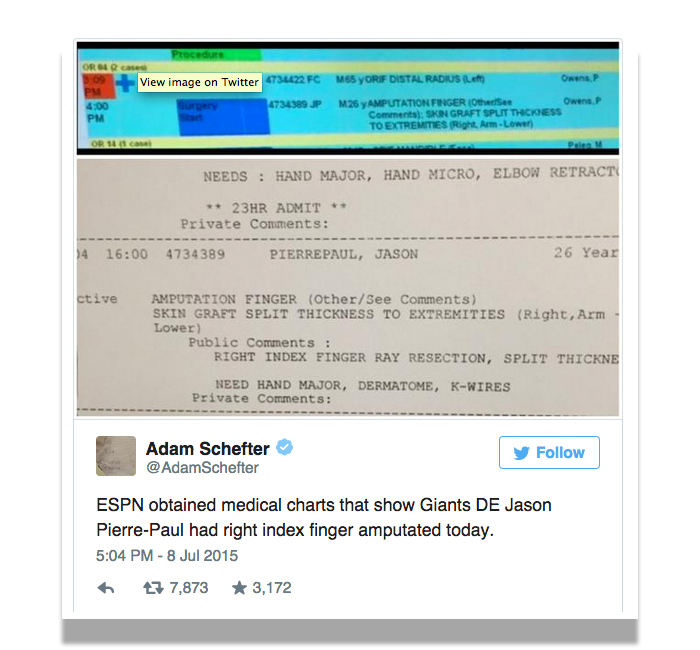 Should the hospital who treated New York Giants defensive end Jason Pierre-Paul, for his hand injury, be held responsible for leaking the medical records to ESPN? 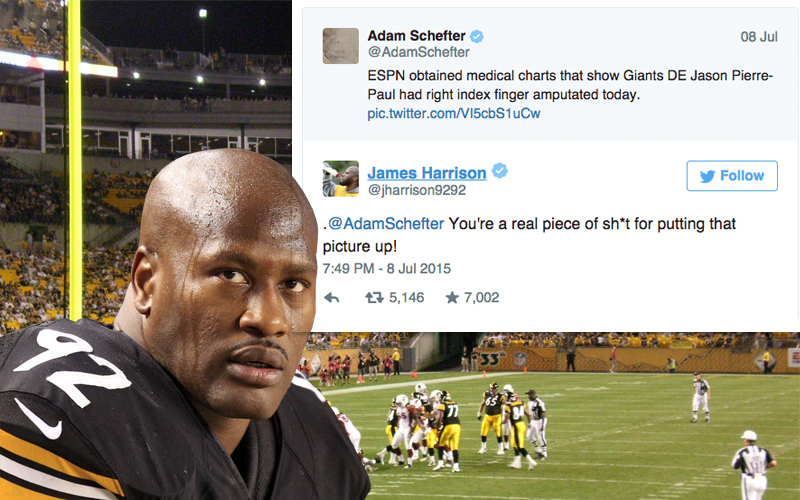 We think so…But, we still love what the Pittsburgh Steelers James Harrison had to say about the issue on Twitter! Below is Schefter’s original tweet. We know Schefter was just reporting the news but “Deebo” wasn’t having it!